the valley has to offer for treasures. washed, and stain free. The best in used clothing is what we stock, and carry. Always providing organic jams, relishes, salsa's. We also specialize in natural goat's milk soap, refreshing scents to choose from. All products are made right here in the Mad River Valley by our local farmers, and gardeners. 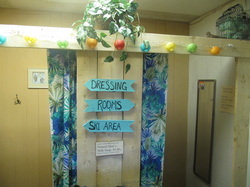 Upon finding great clothing, we offer a clean dressing room. Designed with a bit of an Island appeal to soothe your cold day blues or add some sunny thoughts on a cloudy day. Our goal is to make your shopping experience comfortable, and affordable. We are a hub for recycling gently used clothing, and accessories our mission is to keep quality stuff out of attics, cellars and landfills. 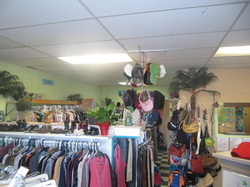 Therefore, it enables us to offer our shoppers beautiful clothing and working treasures at a great price. parents are shopping. We accept donations all the time. Feel free to drop them off at the store in the Mehuron's shopping plaza. Or there is also a donation box at the back of the store for after hours drop off. We check it daily. Thanks for your support, we look forward to serving your needs. Please give us a call if you need help getting your items to the store and we will try to accommodate you.